Cocaine is one of the world’s most in-demand drugs. Its production center is in the Andean region of Colombia, Peru and Bolivia, where hundreds of tons of white powder are produced and shipped to consumer markets around the world every year. And it all starts with the bright green leaves of the coca plant. Now more than ever, this crop lies at the heart of international disputes between historic allies as well as domestic conflicts, tearing at the fabric of local communities. For the past several years, Colombia has reclaimed its title as the world’s biggest cocaine producer, but it has also seen unprecedented expansion, according to the two most respected coca estimate reports. 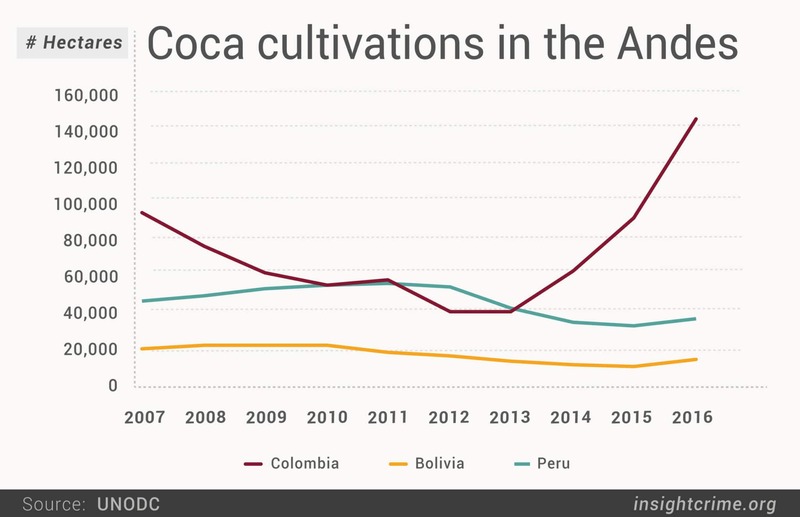 Indeed, while Bolivian and Peruvian coca levels have fallen slightly over the past decade, Colombia’s coca explosion has singlehandedly put global cocaine production on an upward trajectory. 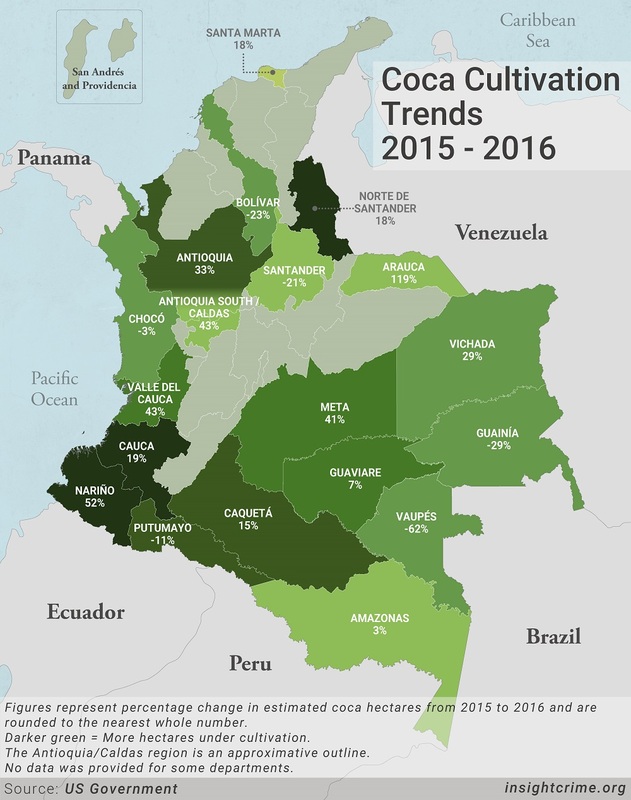 Colombia’s cultivation of illegal crops grew by over 50 percent between 2015 and 2016, from 96,000 hectares to 146,000 hectares, the United Nations reported. According to US estimates, coca cultivation rose nearly 20 percent to 188,000 hectares. “No government or non-governmental organization has estimated such high levels of coca production in Colombia since records began being kept on this issue,” InSight Crime wrote in March. This historic surge is supported by evidence from InSight Crime’s ongoing field research. Illegal groups continue to pressure farmers to grow the crop in some areas, while other farmers do so due to lack of opportunities, as well as the hope that they may eventually receive government benefits as a result. From the information gathered, we believe that actual coca levels far exceed official estimates in many areas. Cocaine producers have also found ever more innovative ways to process the drug, raising the drug yield per hectare. Today, InSight Crime believes that Colombia alone is churning out around 1,200 metric tons of white powder a year. With such huge amounts leaving the country, pressure is mounting for the Colombian government to stem the drug boom. And they have made some questionable decisions in order to achieve this. A November 2016 peace deal with the Revolutionary Armed Forces of Colombia (Fuerzas Armadas Revolucionarias de Colombia – FARC) included a promise that the government would prioritize substitution programs for farmers to voluntarily uproot their coca for legal alternatives. But the process has not been so straight forward. Instead of focus efforts on this softer approach, Colombia’s government opted for a double-pronged policy for 2017: negotiating with farmers while simultaneously boosting forced eradication operations. Predictably, this has led to intense protests by local coca farmers and holdouts against eradicators, with bloody consequences. This finally erupted in October when security forces allegedly massacred several protesting farmers in the world’s biggest coca hub: the municipality of Tumaco in the western department of Nariño. Indeed, internal politics are far from Colombia’s only problems. The United States, after having funneled billions of dollars into the drug war in the country over the past two decades, is expecting far better results. One crucial “difference” is that of aerial fumigation of drug crops, a practice Colombia banned in 2015 due to health concerns. “The United States has been pushing for fumigation to resume since even before Trump entered office, but US officials have failed to address the longstanding argument that aerial spraying has been an ineffective strategy for controlling coca cultivation in Colombia,” we reported following controversial and confusingstatements by Secretary of State Rex Tillerson on the topic. With Donald Trump in the White House and threatening to cut aid to Colombia (and the rest of the world), Colombia is trying to balance smart policy-making on one hand, while maintaining relations with the United States as one of its primary “post-conflict” funders on the other. 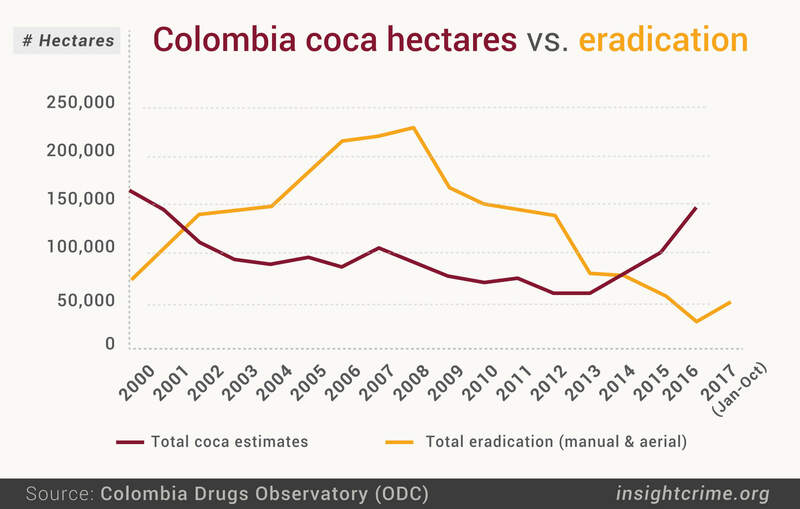 More importantly, there is little evidence that destroying coca fields will lead to a long-lasting reduction in cocaine levels. Many if not most farmers recultivate crops after they have been destroyed, and if no alternative income is available, they have little choice. “The root causes of continued coca cultivation — including poverty, state abandonment and criminal dynamics — are likely more powerful in determining levels of coca cultivation,” we wrote in June. Colombia remains between a rock and a hard place as it enters 2018. While the country has reinvested in its carrot-and-stick policy for another year, it is still waiting for “carrot” substitution programs to kick in, setting the scene for more friction. Even so, it is unlikely that the United States will be satisfied with Colombia’s efforts. The Andean nation may well have to choose between hedging its bets with the effective long-term strategies, and some form of political fallout. But 2018 is a presidential election year in Colombia, which may turn the tables should the opposition come into power. The election of a new political force could undermine peace process promises and replace them with strong-armed anti-drug policies more palatable to the United States.